Home News Video of McDonald’s employee kicking ‘sweet old lady’ out goes viral. Then rest of story comes out. Video of McDonald’s employee kicking ‘sweet old lady’ out goes viral. Then rest of story comes out. A video featuring a McDonald’s employee asking a “sweet old lady” to leave the premises has gone viral, but — of course — without the story in its full context. People were outraged when they saw video of a Lexington, Kentucky, employee asking an elderly woman to leave the restaurant. The video went viral on Facebook, having been viewed more than 1.7 million times. 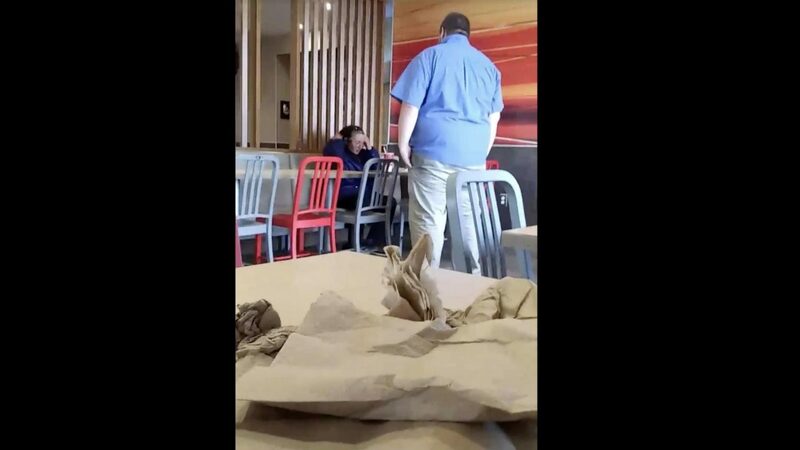 The majority of the video’s commenters voiced their disapproval and anger over the McDonald’s employee asking the woman to leave, with some even going as far as to attack the employee’s appearance. A spokesperson for McDonald’s, however, says that the video does not give the full picture of what was actually occurring, and pointed out that the “sweet old lady” was not actually “minding her business,” as Facebook user Nunez wrote. According to WLEX-TV, there was much more to the story than what was being portrayed on social media. The station revealed that the woman was previously banned from another nearby McDonald’s for “verbally and physically assaulting members of the staff.” The employee was asking her to leave because she was being “loud, obnoxious, and bothering [other customers],” the station said.